Assessing the initial understanding of basic critical thinking concepts and principles. The International Critical Thinking Basic Concepts and Understandings Test, developed by leading international authorities on critical thinking, Dr. Linda Elder and Dr. Richard Paul, along with Foundation for Critical Thinking Research Fellow Dr. Rush Cosgrove, is the first comprehensive and foundational critical thinking concepts and principles test to be developed and offered for online use. 1. the analysis of thought. 5. the obstacles or barriers to critical thought. The test is designed for use at the high school level (grade 10) and above (college, university, graduate level). This test is now available online through our online learning center. Our online testing software has been custom developed by the Foundation for Critical Thinking to provide comprehensive grading and reporting for both the student and teacher. The test measures the extent to which students, faculty, or indeed anyone, understand the fundamental concepts embedded in critical thinking. A high score provides evidence of the person having done some critical thinking about critical thinking. It implies that the person is more likely to think critically than someone scoring low on the test. It measures, in other words, the necessary understandings for thinking critically. Of course, the test cannot guarantee that persons with basic critical thinking understandings will use them effectively in their lives. No critical thinking test can. The Critical Thinking Basic Concepts Test can assist faculty in determining the extent to which that they are succeeding (or not succeeding) in helping students develop the understandings which will enable them to think critically - through content and through problems and issues they will face in their lives. Most importantly, use of the test, especially when combined with other effective critical thinking assessment approaches, has a high degree of consequential validity. In other words, proper use of the test will lead to greater emphasis on the fundamentals of critical thinking. For a richer understanding of assessment in critical thinking, see our white paper: Consequential Validity: Using Assessment to Drive Instruction. In this paper we focus on the primary purpose of assessment in instruction - improvement. The purpose of assessing instruction for critical thinking is to improve the teaching of discipline-based thinking (historical, biological, sociological, mathematical thinking…). It is to improve students’ abilities to think their way through content, problems and issues using disciplined skill in reasoning. The more particular we can be about what we want students to learn about critical thinking, the better can we devise instruction with that particular end in view. Nothing is more important in this process than our conceptualization of critical thinking, which is why we advocate a substantive, robust, transdisciplinary conception of critical thinking. Use of this test can be an important part of the critical thinking assessment process, in providing faculty with data illuminating the extent to which students are learning or have learned the fundamentals of critical thinking. The test may also be used by administrators, for example, in connection with accreditation processes, to assess faculty understanding of critical thinking basic concepts and principles, and therefore readiness to foster critical thinking. The online test provides statistical group data on the test as a whole, as well as on essential critical thinking understandings. It may be used in a pre/post format, and students may retake the test up to eight times with no additional charge per student over a four-year period. Home study teachers, or companies wishing to use the test to assess employee understandings of critical thinking may also benefit from use of the test. This test is licensed for use only under the direction of the Foundation for Critical Thinking (FCT). The online test may not be copied or utilized outside of distribution methods, forms and displays provided directly through www.expertthinking.org. The Foundation for Critical Thinking reserves the right to alter, change or modify the test in any way it deems fit at any time. How is the test packaged and licensed? This test is packaged on a per student basis, NOT per test. Each student may take the test up to 8 times over 4 years. We offer the test for multiple use by one student because it can be a valuable learning and development tool when taken multiple times. Online test results are analyzed and compared over time to show progress, both to the student, and to the "administrator of the test." We suggest a schedule of 2 to 4 times per year on a pre/post test schedule. How to *purchase the test. Group Licensing - Pay at once: Choose this option If you know the exact number of licenses you need. The test may be purchased for a specific number of students in your group. You pay for all student licenses at time of purchase. Volume discounts apply. Group Licensing - Open Billing: Choose this option for larger groups where you do not know the exact number of licenses you need. The test may be licensed for UP TO the maximum number of students you specify. When select Open Billing, your account is created and you are billed for 25% of the total number of licenses purchased at checkout. Once these licenses (25% of total number) have been distributed, you are billed monthly for the number of student test accounts you actually distribute. When you purchase using the "Open Billing" option you are able to "lock-in" the volume discount without being committed to pay for licenses that were not used. Volume discounts apply, but must be qualfied for within six months of the initial purchase. If after six months, fewer licenses have been distributed than the volume discount threshold, the purchaser will be billed for the difference on the number of licenses already distributed. For example: if you purchase 80 licenses at a rate of $8.00 each, you will pay for 20 of them initially (25% of the total). You then have six months to distribute at least 25 licenses, which is the minimum number required for securing the $8.00-per-license rate. If you have distributed only 20 at the end of six months, you will be billed $80.00 - the difference between buying 20 licenses at $8.00 each and buying them at the normal rate of $12.00. If you believe you have a special circumstance that warrants an adjustment of the six-month time limit, please contact us at 1-800-833-3645, or at cct@criticalthinking.org. **Testing accounts that are paid by credit card are activated immediately. Payments by any method other than credit cards (such as purchase order or check payment) will delay activation of your test account until payment is received. Please be aware that there is a no-refund policy on our online tests. We therefore highly recommend that you take the sample test before purchasing the test. Following the completion of each test, all students will see a summary of their results. (see image to the right). This summary page shows the student's total score, scores by section and a graphical display of scores within each of the critical thinking dimensions. A sample screenshot image (right) shows the results of two tests taken by a student. This display indicates both the progress made over multiple test attempts and identifies concepts and areas where a student needs improvement.. We recommend taking the test from 2 to 4 times a year in a pre-test / post-test schedule. Each student may take the test up to 8 times. 1. Student may see only whether she or he answered the question correctly. 3. Student sees the answers to the questions, as well as references for finding the answer, which are generally found in the book: Critical Thinking: Tools for Taking Charge of Your Learning and Your Life. A sample screenshot (below) is taken from the Critical Thinking Basic Skills Test. This sample shows the type of display a student may see. In this case the correct answer is hidden (by the group administrator); however, the student may still see whether they answered correctly. When you purchase testing licenses for a group, you are automatically provided an additional set of tools to manage your students. The Group Administrator (the account that purchases the test licenses) has access to rosters, group statistics, and the ability to customize the test result displays, allowing it to be used for assessment purposes or as online learning tool. A student enrollment link is provided for the group administrator to distribute to their students along with a group password. Students are guided through a simple account setup process and then taken directly to their test. Following the completion of a test, the student will see a summary of their results. (see above). Depending upon your purpose for distributing the test, you may customize the post-test display for the student. For example, if you wish to use the test for evaluation and assessment purposes, you may not want to allow the student to see the actual questions after they have taken the test. The administrator may choose to always show the questions, always hide the questions or to allow the students to see the questions and answers after taking the test a designated number of times. Additionally the administrator may choose to show the questions, but hide the answers selections from the student (see sample of Question display above). Regardless of the customization of the student displays, the administrator is always able to view all options. Administrators are given access to both a roster, which displays each students test scores (with links to view each test) , a statistics summary page, and a statistics generation form. The statistics form allows you to compare test attempt scores and averages between different test attempts and tests taken at different times. 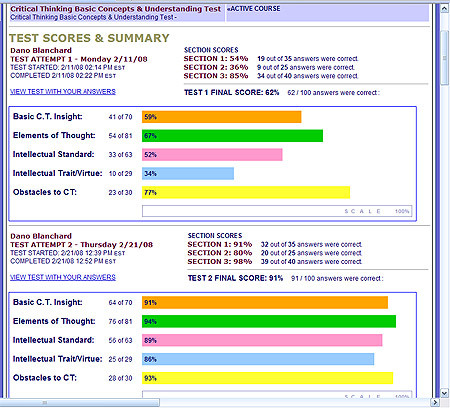 The sample screenshot (right) shows the comparison of student test score averages between a pre and post test. A sample of test summary information included appears below. (note data displayed in samples is not from actual student scores). Though multiple customization options are offered, administrator and student accounts are easy to set up and use.